Angiosarcoma (AS) is a rare and aggressive soft tissue sarcoma that can arise in any anatomic location. AS tumors are comprised of rapidly proliferating and highly infiltrating neoplastic cells of mesenchymal/endothelial origin that form vascular like blood filled channels (1-4). Of all the sarcoma subtypes, AS harbors the worst prognosis with a 5-year overall survival rate of less than 30% (2, 4). They account for less than 1% of soft tissue sarcomas which in turn account for 1% of adult solid malignancies (2). This low incidence rate contributes to a lack of understanding of the underlying factors that drive the progression of these tumors. Unlike many other solid tumors, angiosarcomas metastasize freely because the malignant cells are in constant contact with the blood stream. This fact means that even if surgical resection of the primary tumor is achieved, even if there are clear margins, even if there is no evidence of disease, this cancer can and most likely will come back. Angiosarcoma can return to the original site of the primary tumor or can show up anywhere in the body. What does Angiosarcoma really mean? The term angiosarcoma, when broken down is Angio (blood or lymph vessel) and Sarcoma (flesh, or connective tissue cancer). In other words, the lining of the blood vessels (endothelial cells) become malignant. In angiosarcoma, the endothelial cells grow uncontrollably and create more blood vessels until a tumor composed of blood vessels has formed. This cancer is particularly aggressive because it has a high rate of metastasis. Figure 1. 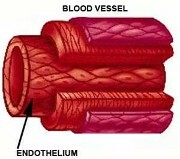 Architecture of a typical blood vessel (3). The lining of blood vessels are comprised of endothelial cells, these are the cells in direct contact with blood. Signals to and from the endothelium cause new blood vessels to sprout/arise in a process called angiogenesis. When this process is not controlled, vascular tumors like angiosarcomas can arise. Angiogenesis has been extensively studied in cancer biology for a number of years because ALL solid cancer tumors need to create new blood vessels to grow. The need for more insight into the pathogenesis and causal factors which lead to angiosarcoma is crucial. If we can learn how to inhibit angiosarcoma, this could provide the basis for a wide array of tools that might elucidate mechanisms to inhibit other solid tumors that rely on angiogenesis.